So I know this is going to come as a holy boo-nanas shocker to everyone, but I wasn’t that popular in school. I wore spiffy clothes, drew weird cartoons on all my homework, and had this weird thing called “potential” that I was clearly not fulfilling looking like that. But there was someone always there for me, even though that someone lived in a book. Her name was Lenore, and she’s a cute little dead girl. Also, fun fact in school, I totally had Roman Dirge and Jhonen Vasquez pictures all over my binder because they were my first man crushes. I know, I don’t get how nobody wanted to be my friend either! Mooovvving on, Lenore! I’m sure all of us have seen this adorable little dead cutie at one time or another. First introduced in 1998 by the aforementioned Roman Dirge, she’s since had a pretty great run since then. Her most recent being a six issue series that was released in July of 2013. Published by Slave Labor Graphics, the Lenore series has been split into several volumes. 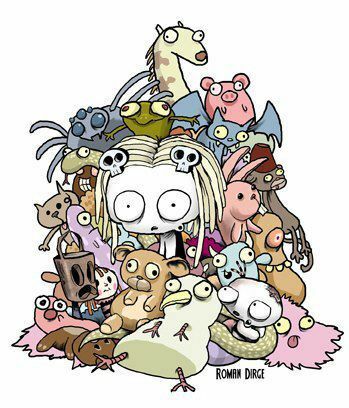 I believe one of the reasons that she’s had such a successful time in comic book land is because of the unique mix of cuteness and macabre every issues has. 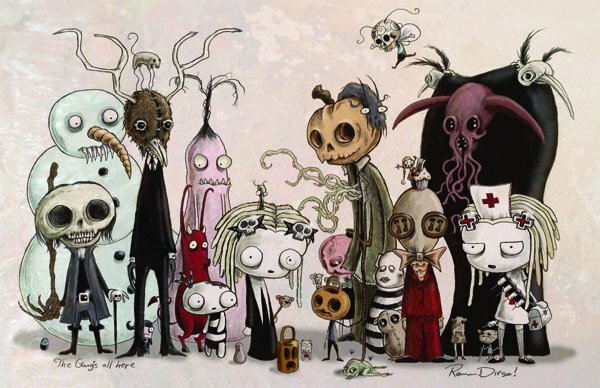 Staying true to Dirge’s style, there’s blood, there’s guts, there’s dollies and cute little critters, oh my! If you’ve never seen any of Roman Dirge’s artwork, you simply must because it is amazing and unique as hell. Even if spooky isn’t exactly your style, I think everyone can appreciate the talent this man has flowing out of his weird little fingertips. 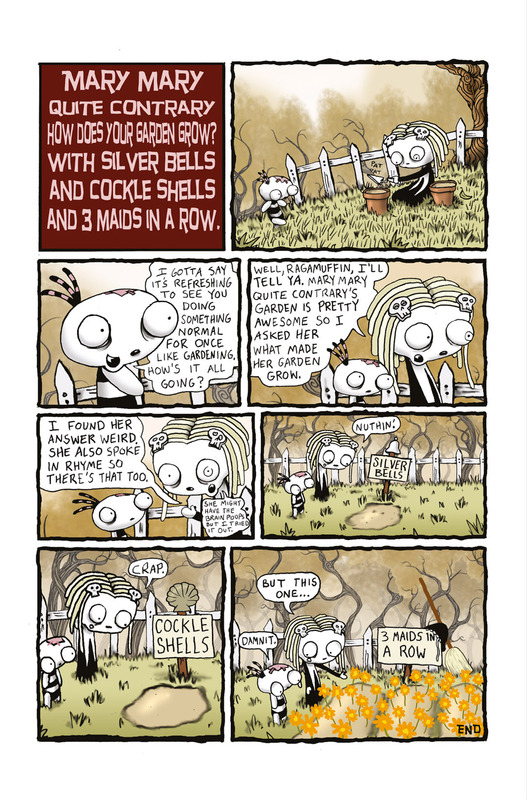 One interesting thing about Lenore’s world is that it is heavily influenced by Edgar Allan Poe. Obviously her name is based on a poem by him, and she lives in a town called Nevermore. And as sweet as Lenore is, she has a bad habit of um, killing her friends. She doesn’t usually do it on purpose, but hey, it happens. A lot of times she’ll think she’s helping out one of her many strange friends, but instead is actually doing the opposite and causing a bit of mayhem. She has gone through several personality changes within issues, but always ends up being the same cute little dead girl. And hey, just because you’re an adult doesn’t mean you don’t want a little gorey cuteness now and then. Who can hate on a series that has characters named Ouchie Boo-Boo, Mr. Gosh, and Pooty Applewater? Screenblast, a website by Sony, had 2-4 minute shorts of Lenore at one point, and as a fan, it was a bit strange to see these characters I had grown to know and love moving around and talking. Though entertaining, I think we can all agree that comic book form is definitely the best way to see these characters. 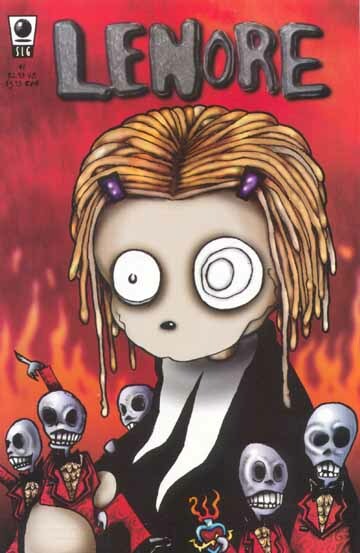 There were even plans to make a Lenore film by Sony, but Dirge wasn’t having it. At his 2011 Comic Con panel, he stated that Neil Gaiman would serve as executive producer on a Lenore film, but it’s been five years, where is our Lenore film?! Now Lenore isn’t for everybody, that’s perfectly clear. But there is something so damn sweet and innocent about her, even though she is well, a dead girl who has some very odd and even downright scary friends. The lightheartedness of the series is one that is perfectly balanced between two themes: cute and darkly macabre, which is not an easy thing to do. Though she may be dead and morbid, you just can’t help but want to pick her up and squeeze her. Just don’t squeeze too hard because accidents have been known to happen. Awesome post! Saw a few issues of the 1st series 1998 in half price books – will have to go back and pick them up!